Tool steel Market size was worth over USD 4.5 billion in 2017 and industry expects consumption at over 2.5 million tons by 2024. 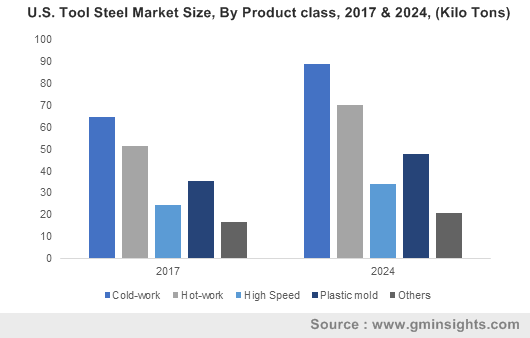 Increasing investments in infrastructure projects in China, Japan and India, along with rising demand for commercial and residential buildings may accelerate growth of tool steel market size. Infrastructure spending in India was valued at over USD 10 billion in 2018 which presents numerous growth opportunities for construction activities. These products possess high durability and allow mass production of molded plastics used in building insulation, roofing, flooring, windows and doors which may further increase product demand. Growing demand for forged metals from factory automation, defence, automotive and aerospace industries may promote the market growth. Global forging market size should surpass USD 85 billion by 2024, thereby creating ample growth opportunities. Growth in manufacturing activities owing to increase in foreign investments and favourable government policies has led to growing adoption of forged products. This product offers various benefits such as high strength, hardness, and resistance to cracking, & high temperature which increases its suitability for forging processes and may further stimulate product demand. Rising consumer preferences for carbide-based cutting tools may restrain tool steel market growth. Carbide tools & inserts are rapidly replacing products majorly in face milling, turning and boring applications owing to their higher cutting speed. However, the product is highly ideal for intermittent cutting operations and provides cost benefits as compared to other counterparts which should increase product demand. Tungsten tool steel market size may surpass USD 630 million by 2024 pertaining to rising demand for hot forming and high-speed applications. Tungsten imparts greater hardness, toughness and the ability to retain the product’s original properties at high temperatures. These products find extensive use in gear cutters, drills, milling cutters, taps, and saw blades which should further stimulate market growth. Vanadium tool steel industry size may witness gains at over 4% in the forecast period. Vanadium improves wear resistance, provides high hardness, enhances cutting performance of products. They are extensively used in several applications such as burnishing tools, draw dies, stamping dies, shear blades and coining tools which should promote market growth. Cold-work tool steel exceeded USD 1 billion in 2017 owing to increasing demand for punching & cutting instrument manufacture. These products find widespread usage in the production of blades, dies, hobs, drawing dies, threading dies and thread rollers. Also, these products offer various advantages such as low cost, high wear resistance, long performance life, and excellent toughness which may further boost market growth. High speed tool steel market size should witness gains at about 4.5% by 2024 primarily owing to increasing demand for manufacturing machine tools. These products exhibit high hardness, strength, turning speed and excellent high-temperature abrasion properties which makes them suitable for automobile cam-rings and valve inserts. Moreover, they have several applications such as gear cutters, milling cutters, saw blades and drill manufacture which should increase product demand. Tool steel market size from injection molding applications surpassed USD 1.25 billion in 2017. These products possess various desirable properties such as high polishing ability, hardness, tear & wear resistance, thermal stability and corrosion resistance. They find extensive usage in molding various types of plastics such as ABS, polypropylene, polycarbonate, polyvinyl chloride, and styrene which may further stimulate market growth. Tool steel market demand from die work applications should witness gains of over 4% in the forecast period. These products offer various benefits such as high toughness, less dimensional change, wear resistance and softening resistance. They have various applications such as cold press dies, punch and roll, shear knives, forging & machine dies which may further increase market size. Tool steel market size from automotive was valued at over USD 3 billion in 2017. These products have various advantages such as high temperature strength, dimensional stability, wear resistance, hardness and strength. They play a vital role in the manufacturing of automobile headlamps, cold-press dies for producing automobile parts, engine parts, crankshafts and motorcycle components which should further boost industry growth. Tool steel industry size from food & packaging should surpass USD 700 million by 2024. This product is widely used in the processing of various food items such as dry food, fatty food, alcoholic and acid food. It finds extensive usage in the manufacturing of several food & beverage can tools such as cupper, end and shell tooling which may stimulate product demand. North America, driven by Canada, Mexico, and U.S. tool steel market size should witness gains of over 4% by 2024. 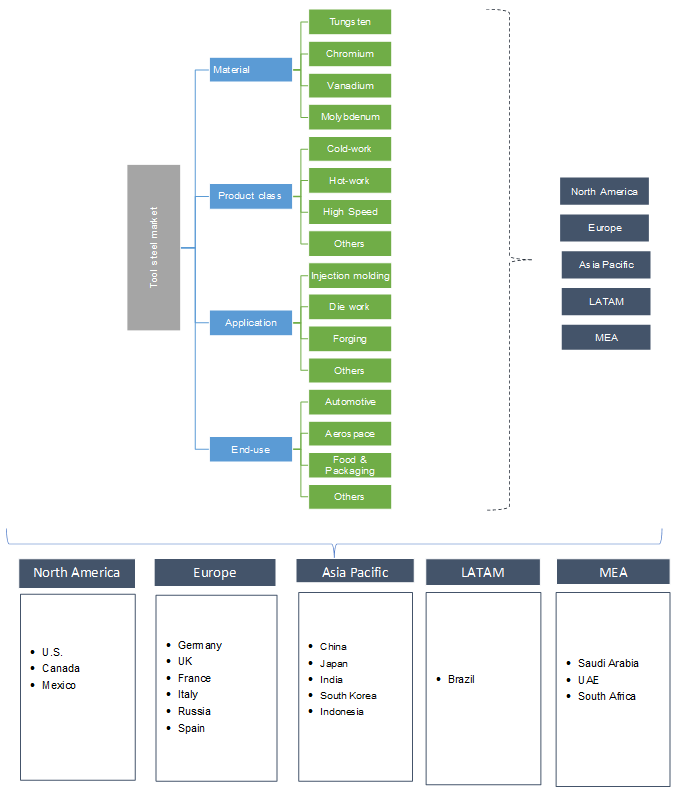 These countries are witnessing high demand from the automotive industry along with rising industrialization and possess a strong manufacturing base. This product plays a key role in the manufacture of automotive injectors, valves, turbocharges, inserts, inner panels, tail lamps and pistons which should further accelerate market growth. Europe tool steel market size driven by Germany, UK, France, and Spain should exceed USD 1.4 billion in the predicted timeframe. These countries are witnessing rising product demand for cutting instrument manufacture owing to its property of retaining high hardness & strength even at high temperatures. High speed products find widespread usage in the manufacture of several tools such as knives, saws, razors, chisels and files pertaining to their high cutting speed which should further stimulate product demand. Global tool steel market share is highly consolidated including participants such as Sandvik, Voestalpine, SCHMOLZ + BICKENBACH, Dongbei Special Steel Group and Tiangong International. Prominent manufacturers are focusing on strategic partnerships to enable market expansion and new product development to attract new customers. These are carbon and alloy metals which possess high cutting efficiency and hardness which makes them suitable for cutting instrument manufacture. These products allow low-cost component manufacture, offers high hardenability and wear resistance. Increasing demand from the manufacturing and automotive industries to produce drills, saw blades, jointer blades, planers, router bits and dies is likely to accelerate market growth.